Many teachers recognise that students with learning difficulties (LDs) need support in a wide range of areas. However, many teachers still do not feel adequately equipped to address students’ needs in inclusive classrooms. This study aims to investigate teachers’ perceptions of how they manage to support students with LDs in inclusive classrooms. Twenty-five Norwegian teachers currently teaching students with learning difficulties in inclusive classrooms participated in this Q methodological study. Results indicate that teachers´ perceptions of how they manage to support students in inclusive classrooms vary markedly. The first viewpoints held by some teachers reflected their contentment with the way they managed to support students during lessons. On the contrary, some teachers were primarily uncertain about how to address students’ instructional and learning needs, while others were ambivalent about whether they were adequately addressing students’ social, emotional and guidance needs. These findings suggest that although some teachers find themselves adequately supporting students, many teachers report that they struggle to meet students’ additional support needs in inclusive classrooms. 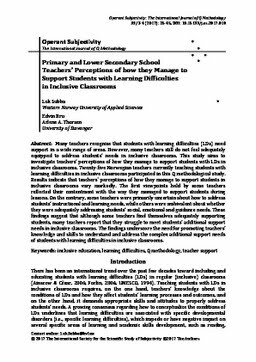 The findings underscore the need for promoting teachers’ knowledge and skills to understand and address the complex additional support needs of students with learning difficulties in inclusive classrooms.